While browsing among the Riva del Garda exhibiting booths, one cannot but notice that the looks of the winter footwear is changing. 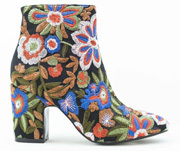 ...roses and bouquets all over, from booties to sneakers. An overarching colour is black, both plain and decorated, to serve as the ideal background to studs and conspicuous buckles in boots and ankle boots. Coming to more comfortable footwear styles, natural leathers and warm shades are prevailing, such as burnt ocher, rust, soft pastels, cream, beige, candy pink, dove grey. Sports footwear, both for men and ladies, is warmed up by fur inserts to be found in all styles, even in flip-flops and wintertime sandals, to go with matching socks.